Coraza Technologies Pvt. 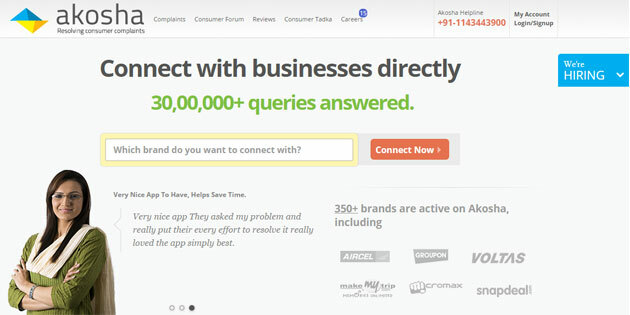 Ltd, which runs an online customer feedback platform Akosha.com, has raised $16 million (Rs 100 crore) in Series B round of funding led by existing investor Sequoia Capital, the company said on Tuesday. The round also saw few unnamed angel investors also participate. The company will use the funds to hire over 200 software engineers and product managers besides technology enhancement, it said. Akosha was founded in 2010 by Ankur Singla, who was joined by Avinash Vankadaru (in operations) and Vishal Pal Chaudhary (in technology). It is an online platform in India that connects consumers and brands for customer service and feedback. Users get information on pricing, discounts, customer service, booking appointments, travel research etc. It claims to be handling over 30,000 consumer inquiries every day over the web, telephone and its android chat app. It monetises these inquiries by providing enterprise software OneDirect to brands. Over 130 companies use its OneDirect platform to respond to consumer inquiries every week. Around 30 of these enterprises are paying customers who subscribe to a premium version of the OneDirect enterprise suite. Kotak Mahindra Bank, Voltas, Aircel, Snapdeal, Micromax and MakeMyTrip are some of the companies currently using Akosha OneDirect enterprise solutions. It also claims 140,000 app downloads so far. Currently, the app supports more than 18,000 chat sessions per day. Over the last one year, the company has grown its employee base from 180 to over 300 and recently opened a technology and product office in Bangalore. Akosha expects to add 400-500 people to its team this year. "With the growth of mobile, we aim at building a messaging platform for all interactions between consumers and businesses including discovery, buying, appointments and customer service. We hope to be doing 100,000 customer interactions per day within three months," Singla said. This is the third round of investment by Sequoia Capital. It last invested $5 million in the company in 2014 and $20,000 in 2011 in Series A and seed rounds, respectively. Akosha.com Coraza Technologies Pvt. Ltd. Sequoia Capital India Advisors Pvt. Ltd.